Location/ Directions: I-35E to Exit #428E (Reunion Blvd/Commerce St (east) and exit to the right. Once at street level, continue to the next traffic light at Houston Street and turn right. Go one (1) block to the next traffic light at Reunion Blvd (west) and turn right. Continue down the incline to the traffic light at Hyatt Regency Drive. Railroad View: Excellent. Any room on the "city side" (north side of building) 3rd floor or higher will give you a great view. The 3rd Floor outdoor sundeck is another great spot to photograph trains. 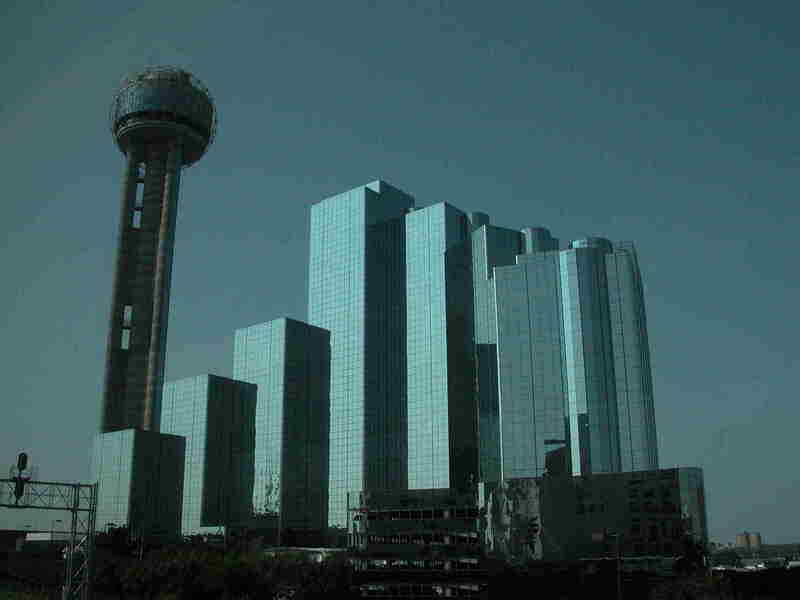 If the 28-floor hotel is not high enough for you, visit the Reunion Tower next door, you can see for miles around in all directions. There is also a restaurant in Reunion Tower. Railroad past Hotel: Union Pacific / BNSF / Amtrak (Texas Eagle) / TRE - Trinity Railway Express (Commuter Rail) / DART - Dallas Area Rapid Transit (Light Rail) / Dallas, Garland & Northeastern Railroad (DGNO, a Rail America Shortline). 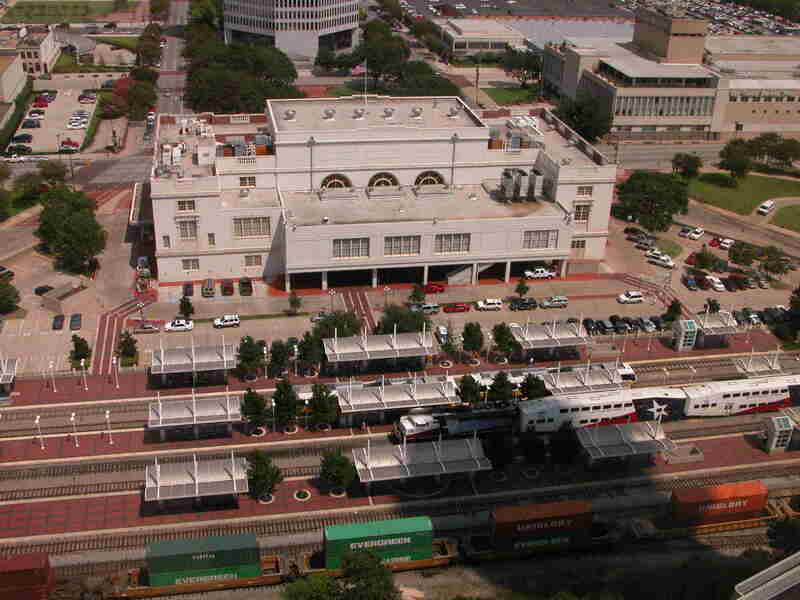 Dallas Union Station is directly in front of the hotel. There is always something moving. Notes: The hotel is located at milepost CPT 217, also known as JFK Junction. The hotel is linked directly to Union Station via an underground tunnel. Trains are close to the hotel, about 100 feet from the front door. Hotel is well soundproofed; you will not hear trains from the room. Comments: First class hotel, no need to leave to go railfanning! Picture Comments: Above Right: View looks west from my room. UP freights use the closest two tracks, TRE, Amtrak, and DART use the platform tracks. Middle Right: Union Station as seen from my room on the 20th floor. 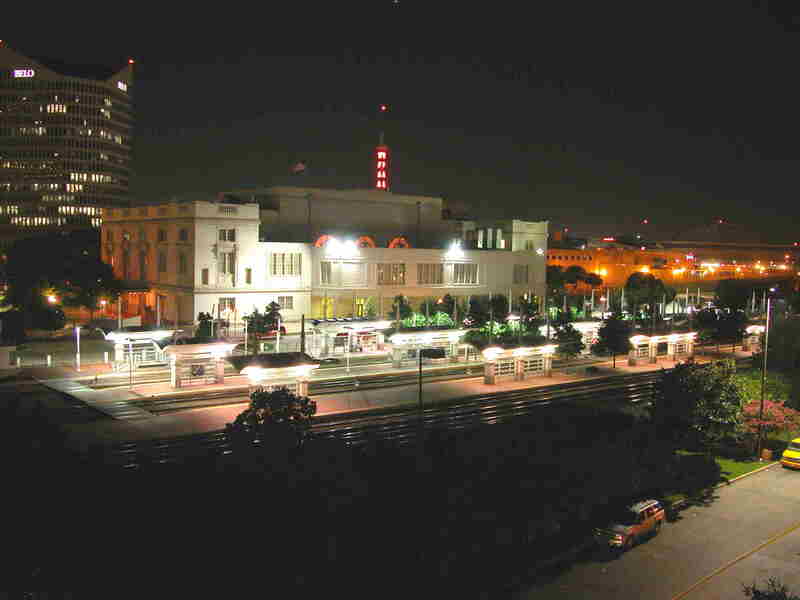 Bottom Right: Night-time photo of Union Station was taken from the 3rd floor "Sundeck". Above: Glass building are good for something! In the morning, natural lighting is not ideal for photo's until the right reflections catch the train at the right time. Here the reflection gave me nice light when a Kansas City Southern Belle painted locomotive leading a BNSF train passed the hotel. This hotel is one of the top railfan motels that we list, a great view, and lots of trains! Walking distance to Amtrak & TRE DALLAS, TX Union Station. 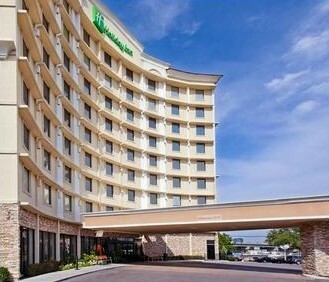 Location/ Directions: The Holiday Inn Dallas Market Center is just North of the I-30 and I-35E intersection in Dallas. Headed North on I-35E exit Market Center Blvd East or a right at the light. Market Center Blvd dead ends into the hotel's parking lot. About Hotel: 9-Floors, 200-Rooms, Interior Corridors, Pets Allowed (fee), Business Center, Health and Fitness Center (On-site), Free High-speed Internet Access, Outdoor Pool, On-site Guest Self-Laundry Facilities (washer/dryer), Daily Housekeeping, Concierge Services, Dedicated Lounge, Ice Machine, Porter/Bellman, Gift Shop, Free Morning Newspaper Delivered to Room, Color Cable / Satellite TV, Stereo, Workspace/Desk, Two-Line Speakerphone with Voice Mail, Free Local Phone Calls, Bathtub, Hairdryer, Private Bathroom, Coffee Maker, Microwave Oven, Mini Refrigerator, Tea Maker, Connecting Rooms, Crib, Double Glazed Windows, Individually Controlled Air Conditioning, Iron / Ironing Board, Rollaway Bed, All rooms non smoking, Hotel Restaurant (on-site). Railroad View: Excellent View! The # 2 Railfan Motel in Dallas (behind the Hyatt holding the # 1 spot) is this Holiday Inn. To compare this to the Hyatt (railroad wise), you will not see the Union Pacific trains here. Additionally at this Holiday Inn you have to make a choice; You can get a room that overlooks the TRE / freight line on the south side, or a room on the north side will overlook DART Light Rail Transit. Rooms will not overlook both. 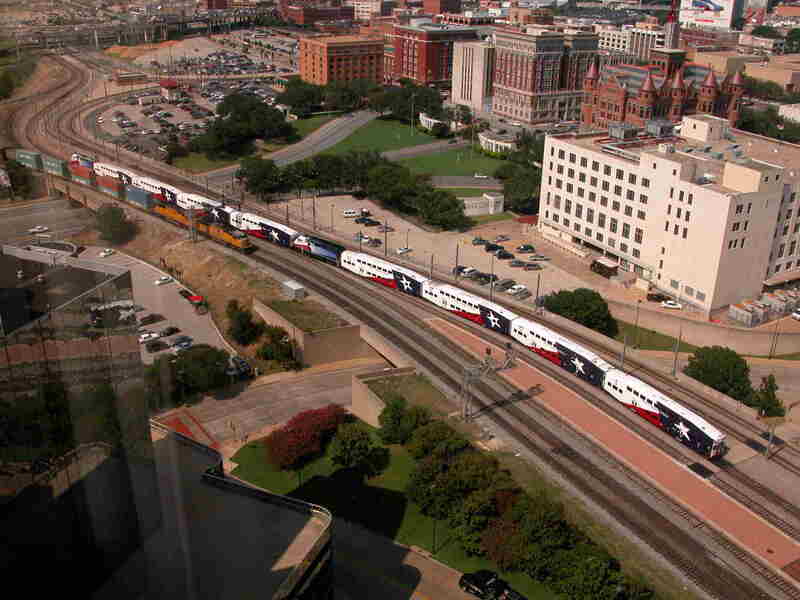 Railroads past Hotel: BNSF Railway / Trinity Railway Express (TRE) / DART Light Rail (Dallas Area Rapid Transit). Notes: This hotel is a 10-minute walk to DART's Light Rail Transit station (Green Line) Market Center Station. The hotel provides a complimentary shuttle service serving a 3 mile radius, which includes this train station located a quarter mile from the hotel. 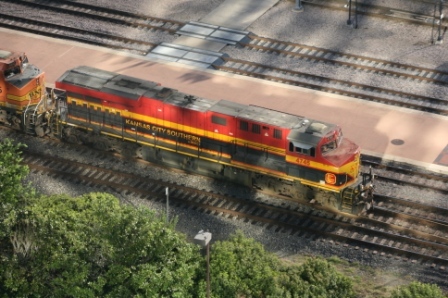 Photo Comment: Above: The 2012 satellite image shows the Holiday Inn circled in yellow, the TRE commuter/BNSF freight line is marked in red, this double track line is located on the south side of the hotel. The line marked with blue is the elevated DART light rail transit line. Its difficult to see in this picture a 4-car DART train passing the hotel. Right photo: A historical aerial photo of this hotel from the late 1990's shows what the rail seen was like before the transit boom of the 2000's. The single track seen near the left side of the picture is now the current day, double tracked TRE commuter line. Before the elevated DART line was built, the land was an abandoned former single track freight railroad. Walking distance to DART Market Center Station (Green Line) DALLAS, TX . .
About Hotel: 3-Floors, 142-Rooms, Interior Corridors, Free high-speed Internet, Free hot buffet breakfast, Complimentary on-site parking, 100% Smoke Free, Pets Allowed (fee), Air conditioning, Alarm clock, Coffee maker/tea service, Crib, Individual climate control, Iron/ironing board, Sofa-Bed, Hair dryer, Separate tub and shower, Color Cable/satellite TV with HBO/ESPN, Dishwasher, Microwave oven, Pots, pans, serving dishes, Refrigerator with icemaker, Silverware, Stove, Table and chairs, Toaster, Evening reception, Fitness Center, Outdoor Pool (Seasonal), Whirlpool. Railroad View: Excellent View! You need a room overlooking I-35E for a railroad view. The railroad is elevated and crosses over I-35E. Railroads past Hotel: BNSF Railway / Trinity Railway Express (commuter railroad). 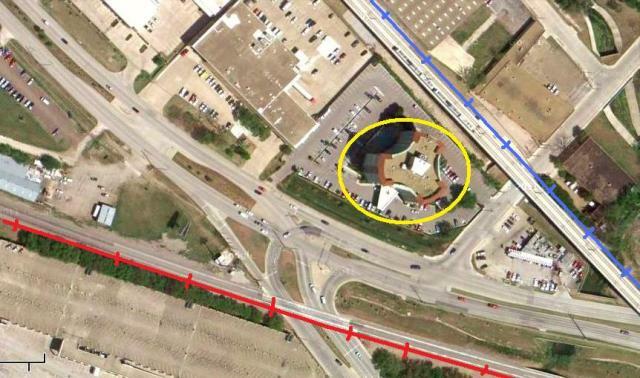 Photo Comment: The large complex of the Residence Inn is circled in yellow. The railroad can be seen crossing the I-35E freeway. Not too many rooms in this motel have a railroad view, if you can see I-35, you should be able to see the railroad.